What words might you use to describe the opposite of peace? How have you witnessed a lack of peace crippling someone, rendering him or her incapable of moving forward in her life? Using Ephesians 4:16 as a reference point, what would be the ill effects of a body that isn’t “fitted and knit together”? What activities, people, or escapes do you tend to seek out when you’re upset and trying to find peace? Slowly and carefully read Ephesians 2:13-14. How does Paul emphasize the way peace with God should affect peace in our relationship with each other? What are some areas of your life where you need to be on the offensive instead of the defensive, taking back ground from the enemy? Ø Discuss what shoes are made of and reason being. Ø Shoe soles-were made of several layers of leather and “are clenched with hobnails, frequently arranged in patterns.” The hollow metal studs provided a firm grip on the soil. The protrusions dug into the ground and kept the soldier sure-footed and stable when holding his ground or advancing against the enemy. Ø Prints of peace of all the things the enemy seeks to steal, kill, and destroy in your life, peace is almost always at or near the top of his list. Ø Satan intentionally stirs up discord, division, disruption and disturbance, both within you and around you. He is lord of chaos and confusion, using every opportunity to upset your sense of well-being and stability. He wants you uneasy, unbalanced, filled with anxiety, worry, and turmoil. Lacking peace. Ø What may start with simmering , low-lying anger, in his hands can turn into opportunities for unforgiveness, which then compound into bitterness and resentment. Then with these strong holds securely in place, you’re much more likely to erect emotional walls that even keep people with good intentions from being allowed into your heart. You become on edge, defensive, unable to foster authentic relationships. Ø Anyone want to share their thoughts from workbook page 97? Ø True peace is best detected and measured against the backdrop of commotion and confusion, when instability abounds, yet you remain steadfast; when disappointment and confusion are near, yet you’re capable of walking with Spirit-infused, confidence, stability, and steadiness. This is how we are fitted with the preparation of the gospel of peace. Ø The shoes that we are being offered and commanded to wear are God-sized, and they can leave footprints of peace in and through your life that you never thought possible. God’s peace can keep your emotional footing sure, your mind and body stabilized and your relationship intact. Ø The spikes in the shoes protrude from the thicker leather soles to make the soldiers stand a firm one. Ø This feature was so critical in maintaining their battle line formations. The soldiers would stand shoulder to shoulder, one beside the other in a tight linear configuration, bringing strength to the whole. Impenetrable. Secure. If even one soldier lost his footing, the hole in the foundation would weaken the line itself, leaving the whole army vulnerable to enemy attack. Ø See soldier’s definition of a unit on page 102 in workbook. Ø Pray for your church. Ask the Lord to bridge any “holes in the line” and revitalize your congregation with fresh passion for pursuing peace with one another. Ø The NAS bible version translates Colossians 3;13 this way: “bearing with one another” – the implication being that the journey toward unity can often be difficult. Patience is a must. “Grinning and bearing it” is sometimes a requirement. Ø Only God’s peace can dig in deep enough to offer the kind of anchoring, grounding, and security we need, keeping us from being knocked over and undone by a potent enemy who’s always on the loose. Ø The vacuum within our hearts can only be occupied by the one thing for which it was created; relationship and intimacy with God. Ø Two types of peace: Peace with God and Peace of God. Ø The gospel doesn’t only stabilize our own hearts, it makes stability possible even with the most unlovable and difficult people or groups of people we encounter. Ø Our salvation is not just about going to heaven and escaping hell. Those are certainly the most extraordinary benefits of our relationship with Jesus, but if our concept of salvation ends there, we’re selling it short. Ø Salvation isn’t just about heaven. It’s about empowered on earth. Ø Read Philippians 4:6-7 – Colossians 3:1 5- Isaiah 26:3-4. Ø Trust leads to thankfulness and gratitude activates peace. Ø Prayer shrouded in gratitude expresses a firm faith. Concentrating on Him instead of being absorbed by our circumstances tells the Lord that we believe He is able to override and overcome even the most difficult issues. Ø When God sees this type of prayerful, grateful faith, when our mind is squared on Him, the peace of God expands within us. It stabilizes our runaway emotions, centers our minds, guides our footsteps and even overflows into our experience with others. It cools our sharp tongue, dismantles our emotional walls, and keeps us from being so difficult to be around. Ø We put on the shoes of peace in this manner – we trust and express gratitude. Then, we experience the peace of God that surpasses all understanding. Ø We need to review pg. 113 in your workbook – good one! Ø Standing firm is not only about digging in. It’s about moving forward. Ø Our peace shoes are go shoes. 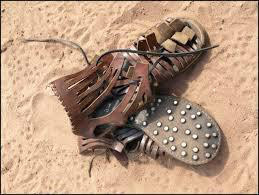 Ø Go shoes are designed to move forward and announce the good news of victory. Powerful enough to tear down, demolish and take back. They can go into territories of your life that may currently be under enemy influence and get it back in Jesus’ name! Ø Through God’s Word, you can pronounce freedom and peace over your own circumstances and even the lives of those you love. Ø Peace intimidates our enemy. He knows we’re coming when we’re all marching in unity with our peace-shoes securely in place. Ø See page 121 in workbook for Armor of God scripture references.